You will never have to remove your teeth again! Tooth loss, gum disease and bone disease affect millions of people worldwide, on every continent, in every age group. Globally, several hundred million people are thought to be missing one or more teeth. More than 40 million people are estimated to be fully edentulous in the United States alone. Completely edentulous jaws (no teeth) are a much more widespread handicap than most of us realize. Major barriers for solving the problem are the perceived complexity, stagnant technology and high cost of treatment. With innovative new solutions this no longer needs to be the case. There is a solution. A cost effective, proven solution. The All-on-4™ solution. 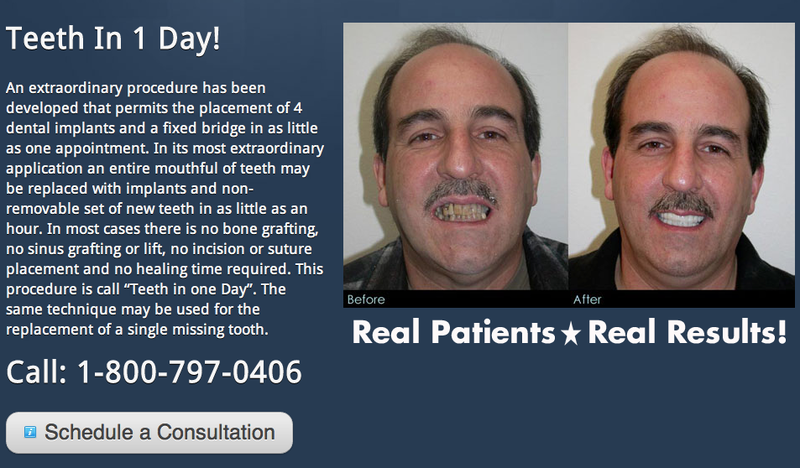 REPLACE MISSING TEETH AND DENTURES IN UST ONE APPOINTMENT! Is this an Implant Secured Denture or Mini Dental Implants? This is NOT a serured Denture, or a Mini Implant system. Many Patients do not understand the concept of Dentures vs. a Permanent Bridge on 4 Implants. Denture [den′chər] Etymology: L, dens, tooth; An artificial tooth or a set of artificial teeth not permanently fixed or implanted. Removable over-dentures on an implant bar provide an improved fit when compared to traditional Dentures, however they are still Removable Dentures. A dental bar is fixed to your jaw bone with two or more implants, providing stronger support for your Removable Dentures. Your new teeth must be Removed for cleaning, and you may still require a palate and excess material on the Dentures to provide stability. Studies have indicated that this solution provides only 60-75% chewing ability, and a diminished ability to taste foods. The All-on-4™ is the modern solution for all missing teeth. This treatment concept replaces your missing teeth with a Full Dental Bridge, No Palate, No Excess Material, Not Removable, and supported by only Four Specialty Dental Implants, with two of the Implants placed at precise angles. With less implants needed, overall treatment time is reduced. The unique All-on-4 solution also ensures greater stability in the bone, reducing the need for bone graft surgery to increase bone volume. Your teeth will look, feel and are brushed much like natural teeth, and you can lead a normal life immediately after a 1 Day surgery. Studies indicate that Patients receive 90-95% chewing ability. Your quality of life is improved and you can start enjoying your favorite foods again. What makes Dr. Golpa Uniquely Qualified to Perform the All-on-4™ Procedure? Dr. Golpa has been placing Dental Implants, with an industry leading success rate, for more than 16 years. Dr. Golpa spent the first half of his career becoming the Premier Cosmetic Dentist in Las Vegas, developing a skilled eye and an artistic hand, Dr. Golpa has been able to create and perfect the most cutting-edge techniques. In early in 2006, Dr. Golpa went to Portugal and began an in depth and personal study of both the surgical and prosthetic protocol, with Dr. Paulo Malo, the inventor of the All-on-4™ procedure. Immediately upon returning home, Dr. Golpa began offering this procedure and now works with All-on-Four cases routinely with patients from all over the world. Dr. Golpa has performed this procedure more than any single Practitioner, besides Dr. Malo himself, in the world. He feels that, in most cases, it provides a better and more permanent solution for his patients. Dr. Golpa's Dental Implant Center is fully equipped with imaging equipment, an on-site lab and an experienced team to provide you with the best care possible. The ideal candidates for Teeth-in-1-Day (All-on-Four or All-on-6 Dental Implants) are those who are about to lose all of their teeth or those who are current denture wearers. I've been told I'm not a candidate for a permanent fixed bridge or Implant due to bone loss. Am I a candidate for Dental Implants with the All-on-4 procedure? 90% of Patients that have been told they are not candidates for traditional Dental Implant options are candidates for this procedure. This procedure uses the frontal area of the jaw and in most cases requires no bone grafting or sinus augmentation. Considering the fact that the frontal part of the jaw has the more dense bone, instead of the conventional method of placing the Implant straight into the bone (which can require sinus lift and bone grafting) and minimum 6 to 9 months waiting time and healing time, this technique differentiates by placing the back Implants at an angle. Not only do you benefit from the dense bone in the frontal part of the jaw, but we can place a longer Implant, with a much less invasive procedure, without entering into the sinus cavity on the upper arch. The surgery takes 2 hours per arch under sedation (Sleep Dentistry) and you will get a permanently fixed bridge set of teeth in just one day! Is there going to be pain? Since the surgery is much less invasive, is performed under sedation, and the Patient is given anti-inflammatory medication prior to surgery, there is little to no discomfort and swelling. No healing time or bone integration is required to secure the Fixed Bridge onto the Implant due to the fact that the Implants are anchored into the bone. The usual 6-9 month bone integration is not required in most cases because we gain solid primary stability at the initial placement of these Specialized Implants. All of my remaining teeth need to be extracted, How can the bridge be put on right after the surgery? Isn't time needed for healing ? Aren't the gum too sore to handle the load of the fixed bridge and could I get dry sockets? This is the least invasive procedure which is done under sedation. After extraction and implant placement, the bridge will be sitting on implants only and NOT on the soft tissue. The gum will be completely closed up after surgery therefore there is no socket exposed and no dry socket.. Patients are placed on anti- inflammatory medication prior to surgery, therefore there is no pain or swelling. 9 out of 10 patients do not even take any pain medication after this procedure. The first step in this life-changing procedure is to schedule your consultation with Dr. Golpa. Your consultation will include a FREE CAT-SCAN & CAT-SCAN VIEWER SOFTWARE on a DVD, as well as an INFORMATIONAL PRESENTATION FROM DR. GOLPA, that you can take home with you! (A $800 DOLLAR VALUE). Because Dr.Golpa's time and expertise is valuable (performing an average of 15 All-on-4 Procedures per month, as well as dozens of Same-Day Single Dental Implant, Advanced Cosmetic and Complex Full-Mouth Procedures per month) We charge a nominal fee of $150 for your personalized consultation (the fee will go towards treatment). Consider this; AT MANY PRACTICES WHEN YOU GO IN FOR A FREE CONSULTATION YOU MAY NEVER EVEN SPEAK TO THE DENTIST, INSTEAD YOU WILL SIT IN FRONT OF A FINANCE OR SALESPERSON WHO’S ONLY GOAL IS TO EXTRACT MONEY FROM YOU! WHEN YOU COME IN FOR A CONSULTATION WITH DR. GOLPA, HE WILL TAKE THE TIME TO LISTEN TO YOUR CONCERNS AND EXPLAIN YOUR OPTIONS. TOGETHER, YOU AND DR. GOLPA WILL CHOOSE A COURSE OF TREATMENT THAT WORKS FOR YOU! To get started call our office at 702.641.7111 (Las Vegas Local) or 1.800.797.0406 (Toll-Free), to speak with one of our Experienced Dental Consultants. Join the 1000's of Patient who have changed their lives forever, thanks to the expertise of Dr. Golpa and the revolutionary All-on-4 Procedure! At Dr. Golpa’s Dental Implant Center we use only proven technology and proven materials, in order to provide our Patients the highest level of care. If you are looking for the best dental implants there are some things you should know. Nowadays there are more than 150 different companies producing dental implants, those that have been on the market for 20+ years and the really young ones. The secrets of titanium alloy used for implants were released a long time ago. And basically the type of alloy used for implants is the same in every company, but the major differences include: the type of the production, quality of implant surfaces, and biocompatibility of this surface with bone and soft tissue, biomechanical behavior of implant components, and the most important factor - long-term research. There are 3 strongest companies in the world: Nobel Biocare, and Straumann, Astra. These companies have invested millions of dollars in their research for decades and became the most published, safe and predictable. Likewise, Dr. Golpa has invested millions of dollars in equipment, facilities, and advanced training to insure that he provides his Patients the highest level of care. There has been a rise in companies that have taken the technology and produced cheaper implants, that are not bad as well, but Dr. Golpa only uses products are from companies who are able to give best product support, and predictable results from proven research. Dr. Golpa uses Nobel Biocare NobelActive Dental Implants, NobelActive is a unique, next-generation bone-level dental implant. NobelActive 3.0 was named “Best Product 2012″ in the September issue of Dental Product Shopper, a renowned publication in the United States, which focuses on in depth reviews of dental products. This is the highest accolade given by Dental Product Shopper and is reserved only for products that achieve very high scores in the clinician evaluation process. This award follows two recent awards, also from a well-known US publication, where the innovative NobelActive implant system was named to Dentistry Today magazine’s “Top 100 Products 2012″ in the July edition and “Top 25 Implant Products 2012″ in the May edition. If you need Dental Implants, the quality of the Dental Implant is a crucial factor in determining the longevity of your restoration. For Dental Implants that will last a lifetime trust the proven technology behind Nobel Biocare and The Golpa Dental Implant Center. Are You A Candidate for the G4 Implant Solution? Why Choose Dr. Golpa's G4 Implant Solution?